The 1867 Military Reconstruction Act, which encompassed the vision of Radical Republicans, set a new direction for Reconstruction in the South. Republicans saw this law, and three supplementary laws passed by Congress that year, called the Reconstruction Acts, as a way to deal with the disorder in the South. 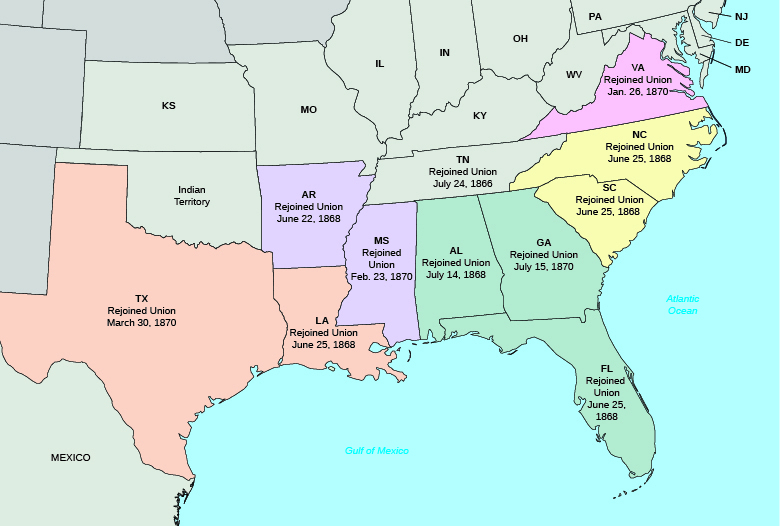 The 1867 act divided the ten southern states that had yet to ratify the Fourteenth Amendment into five military districts (Tennessee had already been readmitted to the Union by this time and so was excluded from these acts). Martial law was imposed, and a Union general commanded each district. These generals and twenty thousand federal troops stationed in the districts were charged with protecting freed people. When a supplementary act extended the right to vote to all freed men of voting age (21 years old), the military in each district oversaw the elections and the registration of voters. Only after new state constitutions had been written and states had ratified the Fourteenth Amendment could these states rejoin the Union. Predictably, President Johnson vetoed the Reconstruction Acts, viewing them as both unnecessary and unconstitutional. Once again, Congress overrode Johnson’s vetoes, and by the end of 1870, all the southern states under military rule had ratified the Fourteenth Amendment and been restored to the Union ([link]). In impeachment proceedings, the House of Representatives serves as the prosecution and the Senate acts as judge, deciding whether the president should be removed from office ([link]). The House brought eleven counts against Johnson, all alleging his encroachment on the powers of Congress. In the Senate, Johnson barely survived. Seven Republicans joined the Democrats and independents to support acquittal; the final vote was 35 to 19, one vote short of the required two-thirds majority. The Radicals then dropped the impeachment effort, but the events had effectively silenced President Johnson, and Radical Republicans continued with their plan to reconstruct the South. Despite these weaknesses, the language of the amendment did provide for universal manhood suffrage—the right of all men to vote—and crucially identified black men, including those who had been slaves, as deserving the right to vote. This, the third and final of the Reconstruction amendments, was ratified in 1870 ([link]). 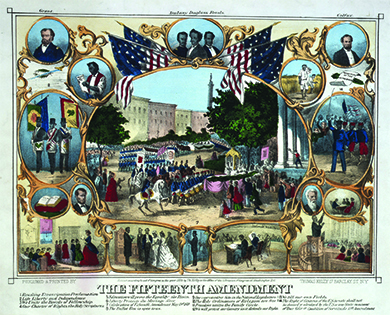 With the ratification of the Fifteenth Amendment, many believed that the process of restoring the Union was safely coming to a close and that the rights of freed slaves were finally secure. African American communities expressed great hope as they celebrated what they understood to be a national confirmation of their unqualified citizenship. ARTICLE 5.—All Woman Suffrage Societies throughout the country shall be welcomed as auxiliaries; and their accredited officers or duly appointed representatives shall be recognized as members of the National Association. OFFICERS OF THE NATIONAL WOMAN SUFFRAGE ASSOCIATION. 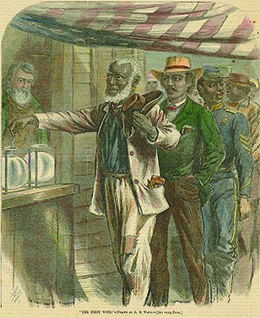 Black voter registration in the late 1860s and the ratification of the Fifteenth Amendment finally brought what Lincoln had characterized as “a new birth of freedom.” Union Leagues, fraternal groups founded in the North that promoted loyalty to the Union and the Republican Party during the Civil War, expanded into the South after the war and were transformed into political clubs that served both political and civic functions. As centers of the black communities in the South, the leagues became vehicles for the dissemination of information, acted as mediators between members of the black community and the white establishment, and served other practical functions like helping to build schools and churches for the community they served. As extensions of the Republican Party, these leagues worked to enroll newly enfranchised black voters, campaign for candidates, and generally help the party win elections ([link]). Under Radical Reconstruction, which of the following did former Confederate states not need to do in order to rejoin the Union? 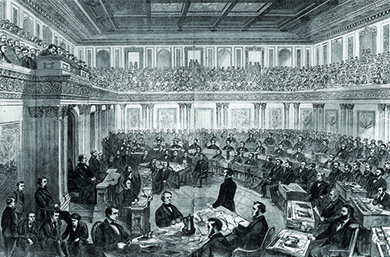 The House of Representatives impeached Andrew Johnson over ________. 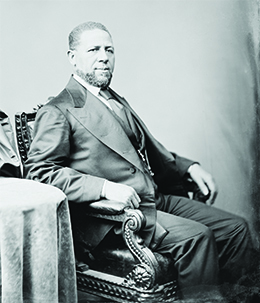 Radical Reconstruction, 1867–1872 by OpenStaxCollege is licensed under a Creative Commons Attribution 4.0 International License, except where otherwise noted.